What a relief. The deep economic contraction earlier this year was temporary after all. New data released Wednesday show the U.S. economy bounced back in the spring, growing at a 4% annual pace in the second quarter. 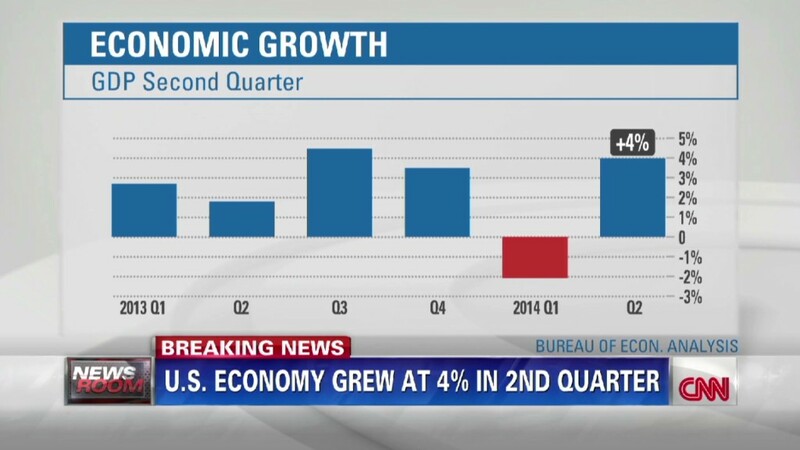 That was even better than the forecast of 3% growth, according to a consensus of economists surveyed by CNNMoney. Consumer spending, which alone accounts for about two thirds of U.S. economic activity, strengthened, as did exports to foreign countries and business investments. American consumers spent more money on long-lasting goods like autos, appliances and furniture, while businesses invested more in technology and industrial equipment. Both can be seen as good signs that households and companies are more optimistic and investing in the future. The Bureau of Economic Analysis also revised historical data, and the new numbers show the bad winter wasn't quite as bleak as last reported. The economy contracted at a 2.1% rate in the first three months of the year, as opposed to the decline of 2.9% reported last month. Meanwhile, the second half of 2013 was also stronger than originally reported. The beginning of the year was marked by a disconnect in the economic data. Employers were hiring at their strongest pace in years despite the drop in GDP. Now, economists are hoping the overall economy is back on track. A separate report released by payroll processing firm ADP (ADP) earlier Wednesday shows the private sector added 218,000 jobs in July. "Businesses are not just spending on new equipment and structures, but manpower, too," said Sal Guatieri, senior economist at BMO Capital Markets. On Friday, the Department of Labor will release its latest jobs report. 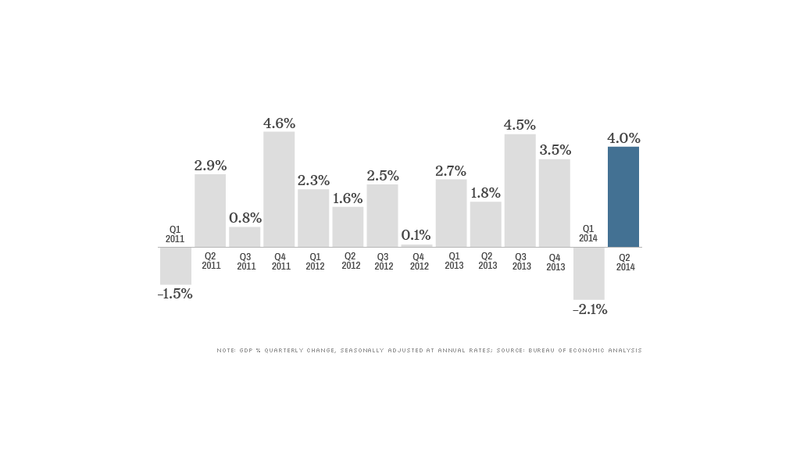 Economists surveyed by CNNMoney predict that 230,000 jobs were added in July. If they're right, that will mark the sixth month in a row where the economy added more than 200,000 jobs. The Federal Reserve is closely watching the data too. The central bank is in the process of winding down its stimulative policies and is expected to consider its first interest rate hike since 2006 sometime soon. "The second half of the year will determine which is the 'real economy,'" said Lynn Reaser, chief economist at Point Loma Nazarene University. "The Fed is betting on strength but needs to see more evidence, as do we all." The task before the Fed is a delicate one. If the Fed hikes rates too soon, it could hinder economic growth. If it waits too long, inflation may rise too quickly. 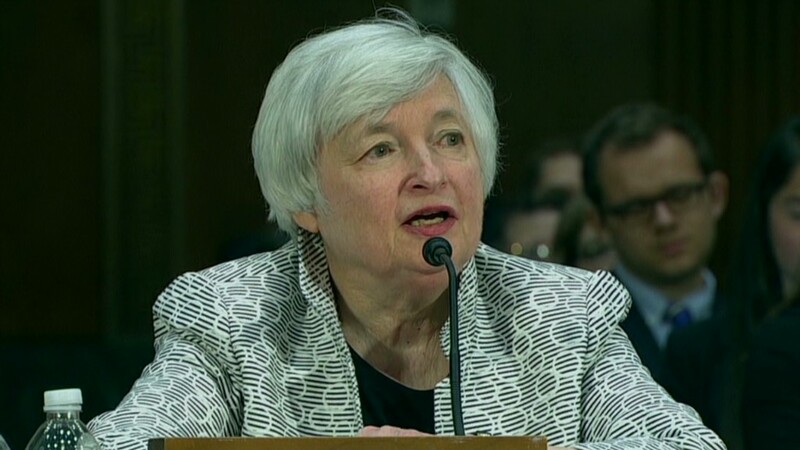 Most economists expect the first rate increase to occur in the spring or summer of 2015. The Fed's top officials will issue their latest policy statement later Wednesday. Fed watchers expect little news, aside from another $10 billion cut in bond purchases. The central bank has been gradually reducing, or tapering, its monthly bond purchases since January.